Edinburgh Airport could be given a massive boost by a new underground rail interchange offering plane passengers direct train links all over Scotland. The idea - which could help the countrys ailing tourism industry - is currently being studied by consultants. It would mean a huge increase in the airports catchment area, could be a step towards making Edinburgh Scotlands main airport and also win new passengers from the north east of England. The proposed new station would involve diverting both the main Edinburgh-Glasgow and Fife lines through the airport. It would require massive investment estimated at well over £100 million - but the benefits are also potentially huge. Consultants Booz, Allen and Hamilton are soon to complete a study into rail access to Edinburgh Airport. Their report is expected in February. Edinburghs position as the countrys fastest-growing airport outside London was confirmed last week with passenger numbers for October soaring to almost 500,000. 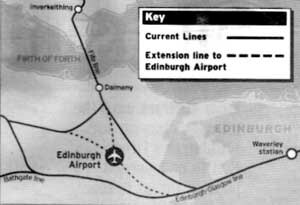 The lack of a rail link to Edinburgh airport has long been a cause for complaint. The rail lines from Glasgow and Fife both pass close to the airport, but travellers on their way to catch a plane have to stay on the train into the city centre, then catch a bus or a taxi. An underground station would give through-links to all Scottish cities simply by diverting existing services. And it would allow the frequency of trains on the Edinburgh-Bathgate line to be increased from every 30 minutes to every 15 minutes. With the removal of the present Fife/Edinburgh rail embankment, possibilities would open for ground aquisition to the east to accommodate an extended infrastructure - EDI's runway 06/24 could de extended to a length of TWO miles.! *CERT NO LONGER A CERT! Up until now, efforts to provide a link have focused the planned CERT express busway from the airport to the city. But the CERT scheme is in trouble and attention is now switching to other options. An industry insider said: "Even a high-quality link like CERT is not going to make that much difference to local traffic going to the airport. "If you live in Edinburgh, youre more likely to go by car to the airport rather than going into the centre and taking public transport out there. "The real benefit is from a direct rail link which could bring together demand from all over Scotland and even the north-east of England. "It would increase the catchment area for the airport and potentially mean more flights to more places. "Tourism is in such a state. Just imagine what a boost it would be to think you could fly in from New York, go downstairs and catch a train to Inverness." Lothians SNP MSP Kenny MacAskill said: "Edinburgh can become Scotlands main airport and the main airport for those outside the Manchester catchment area. The creation of a rail link to Edinburgh Airport is fundamental to its expansion. It should be a major priority." The Scottish Executive confirmed a new railway station under the airport was one of the options being studied by the consultants. A spokeswoman said: "Ministers will take a decision later on whether any of the options should be taken further." Railtrack said it had been in discussions about links to the airport, but the focus so far had been on the CERT link. A ScotRail spokesman said: "A direct rail link to Edinburgh Airport would be the most expensive project to improve the rail network in south-east Scotland, but also potentially the most beneficial." *CERT - Central Edinburgh Rapid Transport ie; a guided busway."